This was a very thriving little village at one time, situated in the midst of a fine agricultural district. The wheat from all the plains west of here is brought to this place fore shipment, and more wheat has been shipped from here some years then from any one point on the Sacrament River. The business of the town is a store of general merchandise, dry goods, clothing, groceries, etc., also agricultural implements and machinery of all kinds, a large warehouse with a storage capacity of then thousand tons, lumber yard, saddlery and harness, a meat market and Princeton Hotel, W.F. Carroll, proprietor and other business houses, residences, school, and church. There is also a ferry that runs across the Sacramento River here. The Princeton Flouring Mill is run by steam power, has one run of stones, and has a capacity of thirty barrels in twelve hours. The Methodist Church South has a very nice edifice. They have a new schoolhouse, which cost some $4,000, which is a credit to any little town. Princeton is situated 14 miles north of Colusa and on a daily stage route from Chico to Colusa. This place, located on the west bank of the Sacramento River, is one of the oldest in point of settlement. 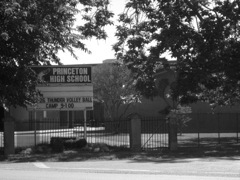 Dr. Andrew Lull, a California pioneer on the 1850s, gave it the name of Princeton, when seeking to have a post office established for this locality. The first postmaster was Mr. Arnet. Henry Vansycle opened the first store and Dr. Lull, assisted by Will S. Green, laid out the first road on the east side of the river running direct to Marysville. As it was once the thoroughfare of the freight current from Colusa to Shasta, and as afterwards from here was shipped the wheat from the plains back of it, it was necessarily a busting thriving little village.